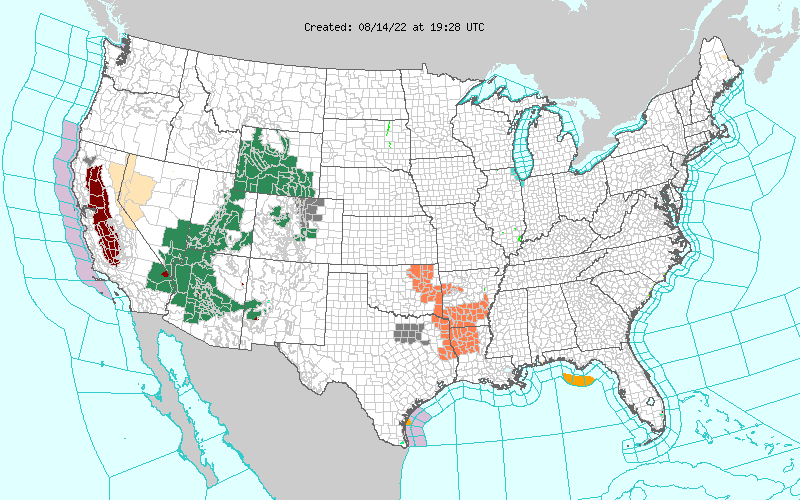 Blog Updated At 4:01 PM MDT Today. 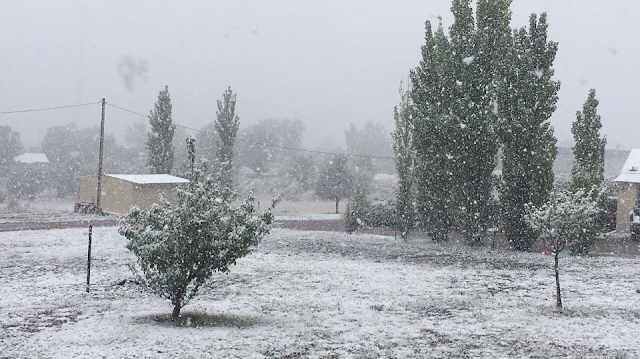 Courtesy Of Rustin Short - 11 AM MDT This Morning. Near Klondike Gap & Cougar Rd's Southwest Of Queen, New Mexico. 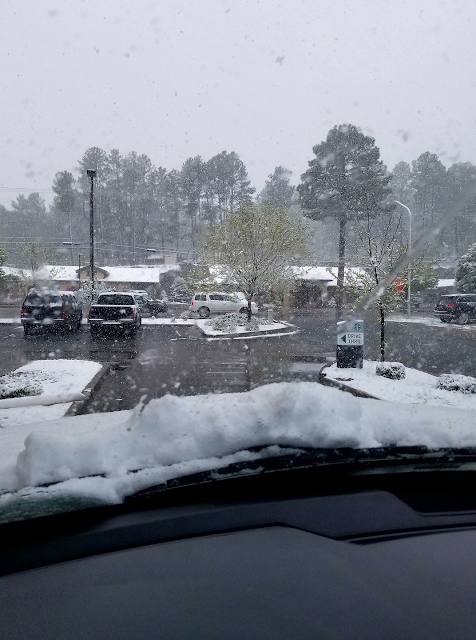 Ruidoso, New Mexico This Afternoon. Glencoe, New Mexico At Noon Today. (Halfway Between Ruidoso Downs And Hondo). Timberon, New Mexico At 8:54 AM MDT This Morning. 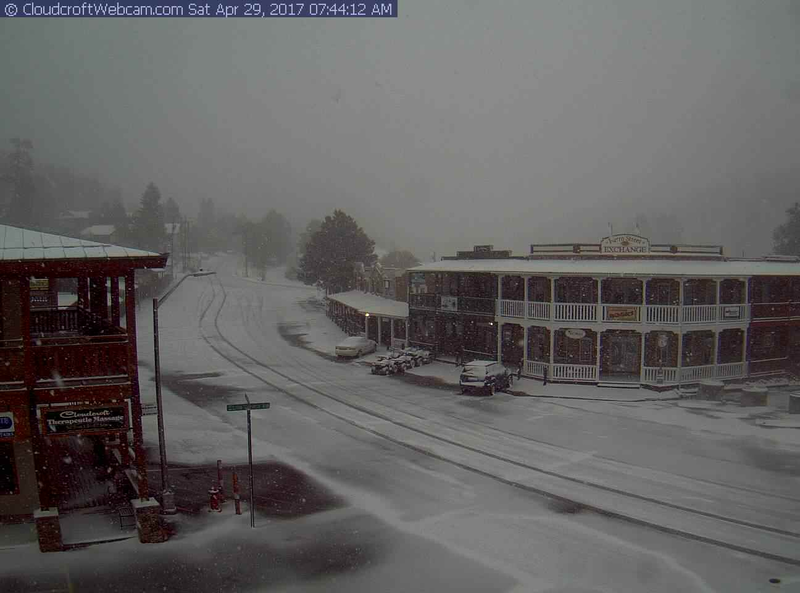 Cloudcroft, New Mexico At 7:44 AM MDT This Morning. 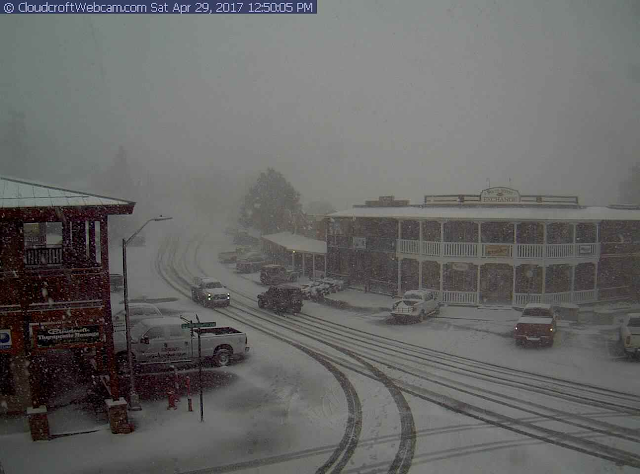 Cloudcroft, New Mexico At 12:50 PM MDT This Afternoon. 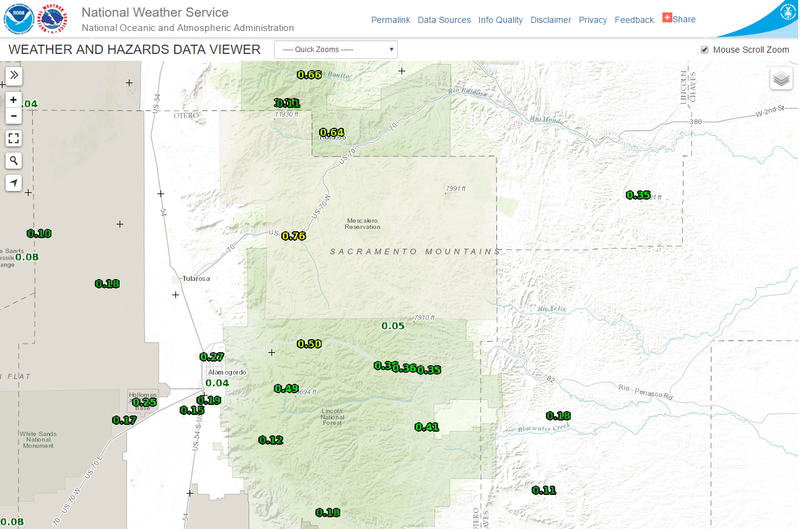 Snow has been falling in the Sacramento and Capitan Mountains overnight into this morning. 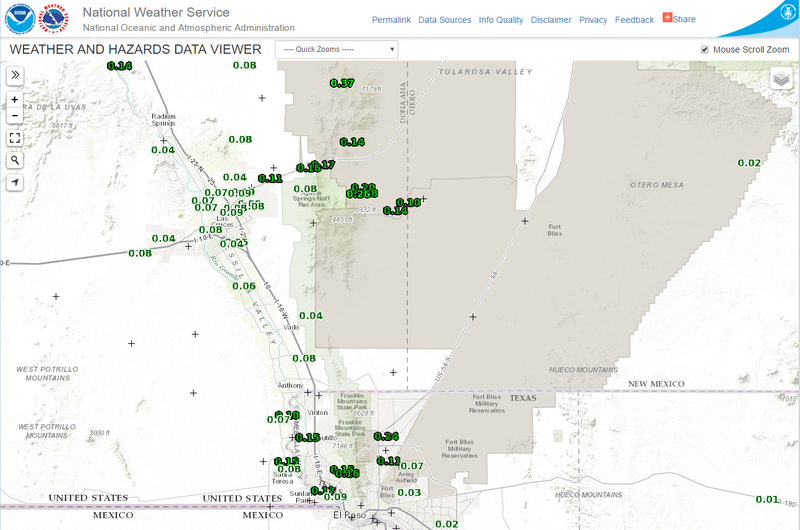 At midnight last night a spotter report near Corona noted 2" on the ground and at 2 AM this morning the Sierra Blanca Snotel (Automated Weather Station) noted 2" on the ground. The public is also reporting 2" of snow on the ground in Cloudcroft this morning. CoCoRaHS reports out of the Ruidoso area this morning indicate 3.0" 3 miles northeast of Bonito Lake, 2.5" 1.6 miles north-northeast of Alto, 2.0" 2 miles west of Angus, and 1.1" 2 miles south-southeast of Alto. No doubt about its raw and cold this morning with widespread temps in the 30's and 40's. The wind chill is down in the 20's in some of the northern areas with north to northeast winds gusting between 30-40 mph. 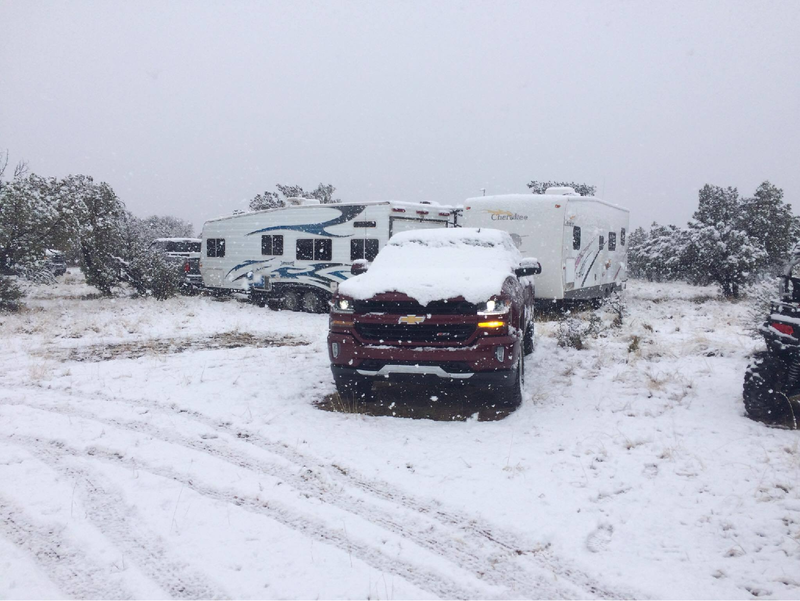 Difficult Driving Conditions On New Mexico Roads. Cannon AFB Dual Pol Radar. 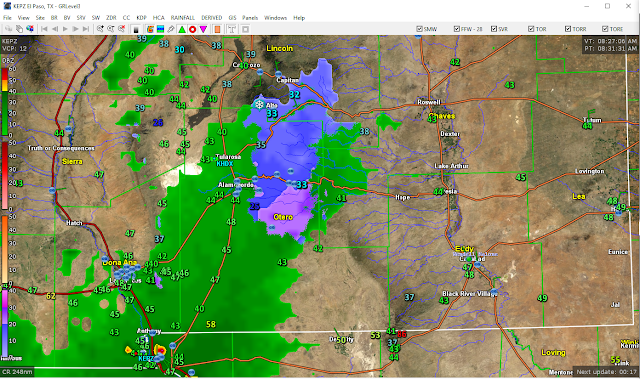 The Artesia Airport AWOS (KATS) was reporting a temp of 41ºF at 3:35 PM MDT this afternoon. Heavy unknown precipitation was falling...translation - sleet. The Carlsbad Airport ASOS (KCNM) was reporting a thunderstorm in progress along with moderate rain at 3:33 PM MDT. 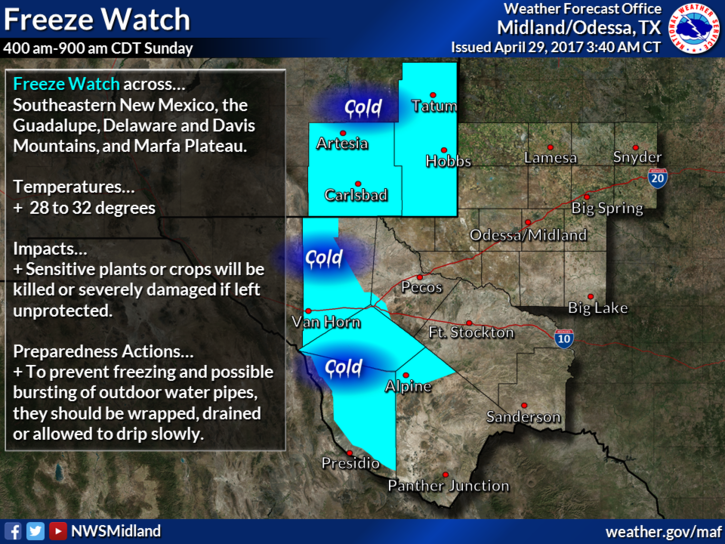 Although radar didn't show any echoes over Artesia at the time a quick look at the infrared satellite images shows that convective showers are breaking out over Eddy County as the cold air aloft associated with the cold upper level closed low to our northwest works its way to the surface. Thus instability showers and thunderstorms are producing pockets of snow and sleet this afternoon. The public has also reported sleet and snow on Rocky Arroyo northwest of Carlsbad. 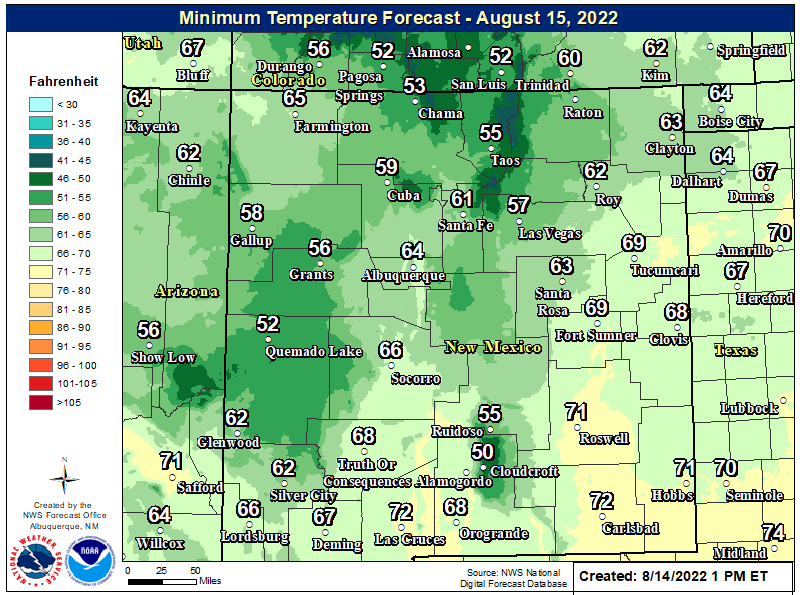 Valid At 8:25 AM MDT This Morning. 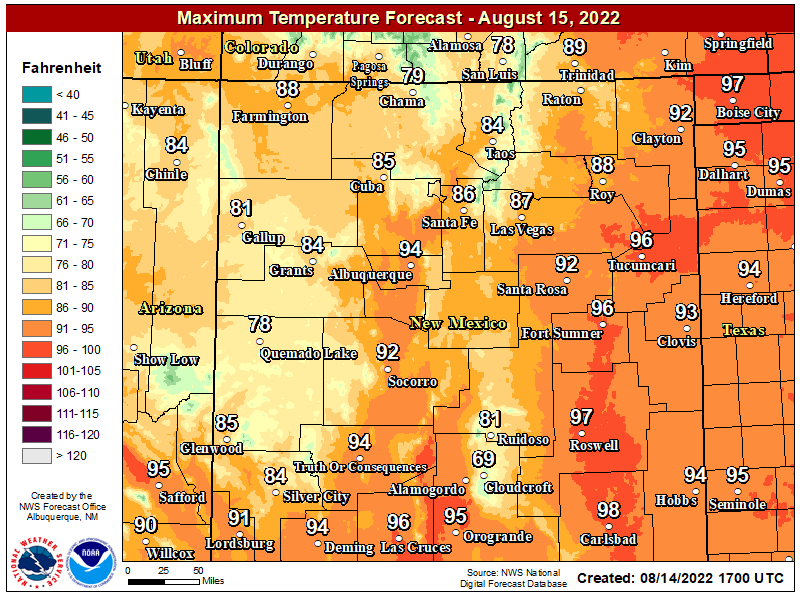 Valid At 9:14 AM MDT This Morning. I zoomed in on the Roswell area at 9:14 AM MDT this morning to show where the rain - snow line is west and north of town. West of town it looks to be along the east face of the Sacramento Mountains from about the Dunken area north to near the Picacho/Sunset area. 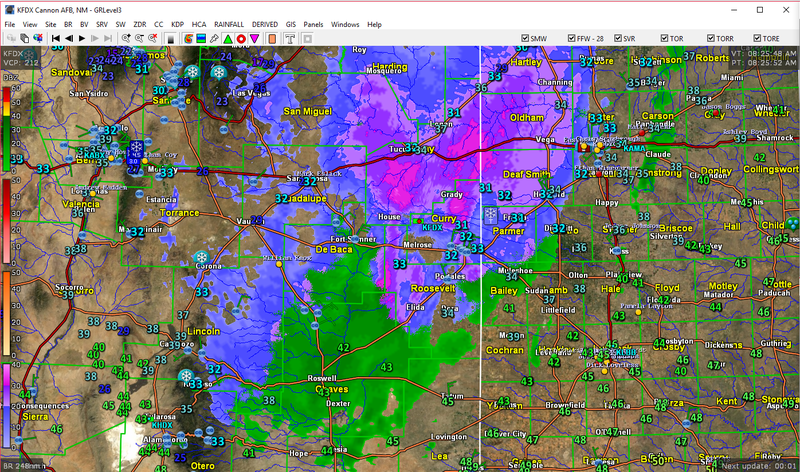 Note the temperature at the Roswell Industrial Air Center (KROW) at 9 AM MDT...39ºF with light rain falling. 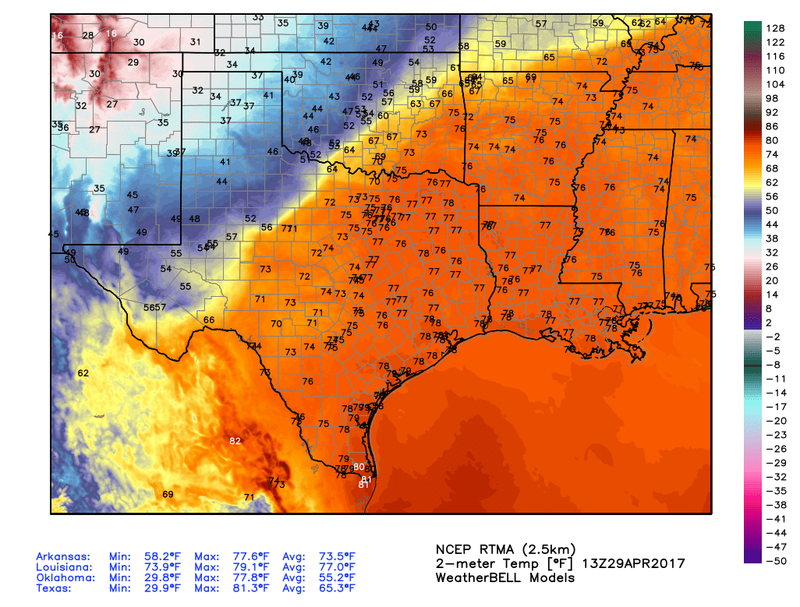 The Dunken Raws was also reporting 39ºF. 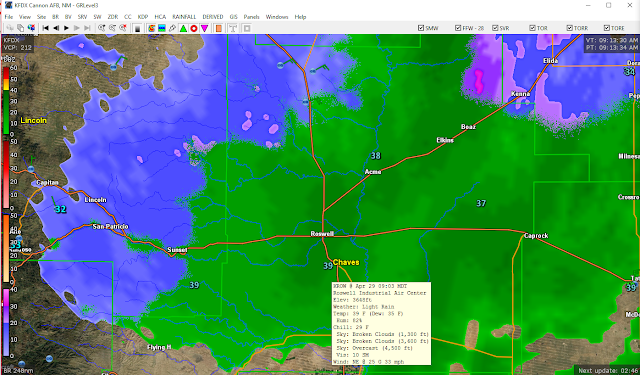 The Sierra Blanca Regional Airport northeast of Ruidoso was reporting 32ºF. It appears that sleet and snow was falling southwest of Portales in the Kenna and Elida area along U.S. Hwy 70. 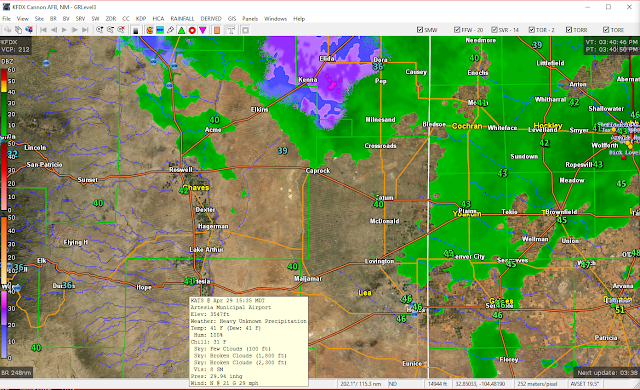 Cannon AFB (KCVS) was reporting 33ºF and light rain at 9 AM MDT. 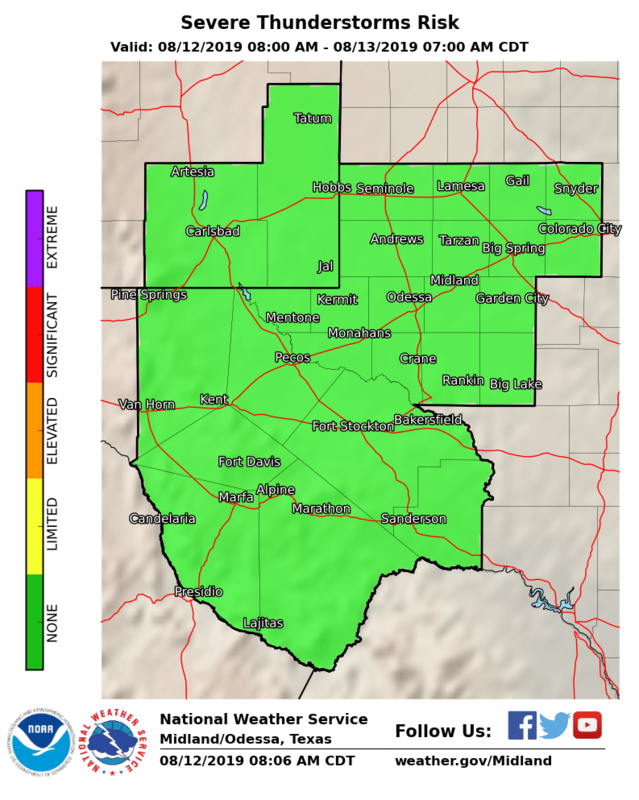 So I still think its possible that we could see a mix of light to moderate rain mixing in with sleet or snow at times today across parts of Southeastern New Mexico including the Pecos Valley. The question is how far south does this come? 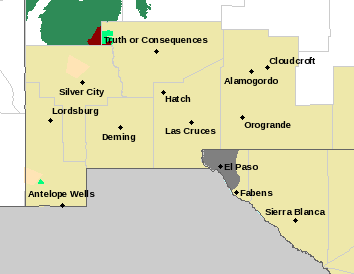 NWS El Paso/Santa Teresa Dual Pol Radar. Valid At 8:31 AM MDT This Morning. Holloman AFB Dual Pol Radar. 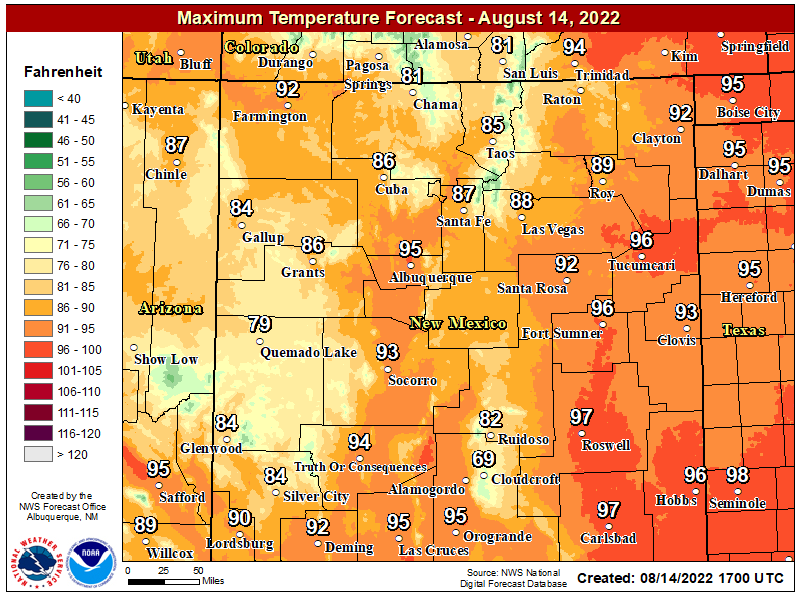 Valid At 8:39 AM MDT This Morning. Local radars are showing a mix of light to moderate rain, sleet, and snow across portions of the area this morning. 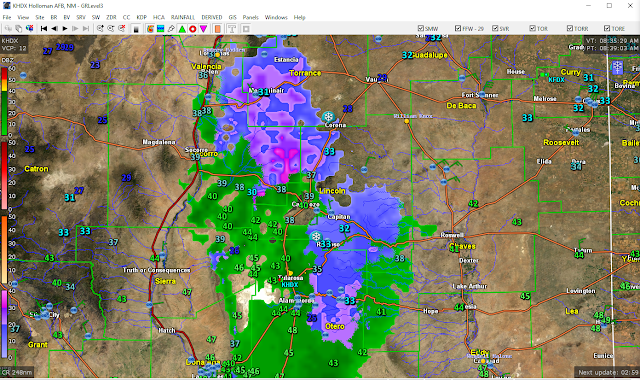 Rain is depicted as the green shades, sleet is the purple shades, and snow is the blue shaded areas. 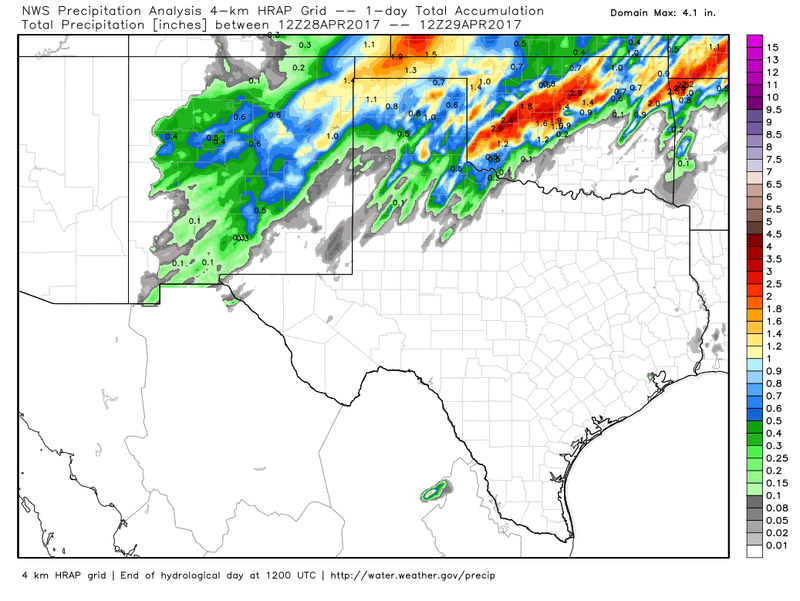 Moderate To Heavy Rain Falls In New Mexico Overnight. 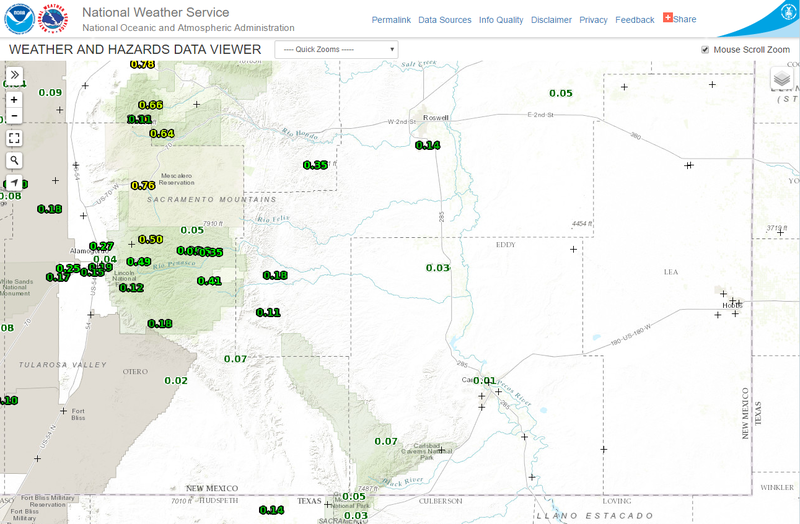 A CoCoRaHS observer 2.0 miles south of Cloudcroft reported a 25-hour rainfall total of 1.19" as of 8 AM MDT this morning. 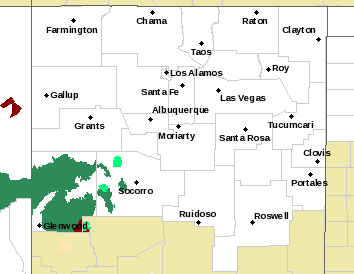 Another observer reported a 24-hour total of 1.06" 1.7 miles west-northwest of Ruidoso. 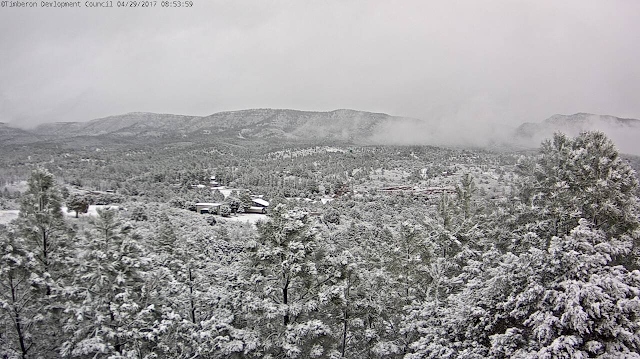 The Sierra Blanca Snotel located near Ski Apache west of Ruidoso is reporting 1.10". 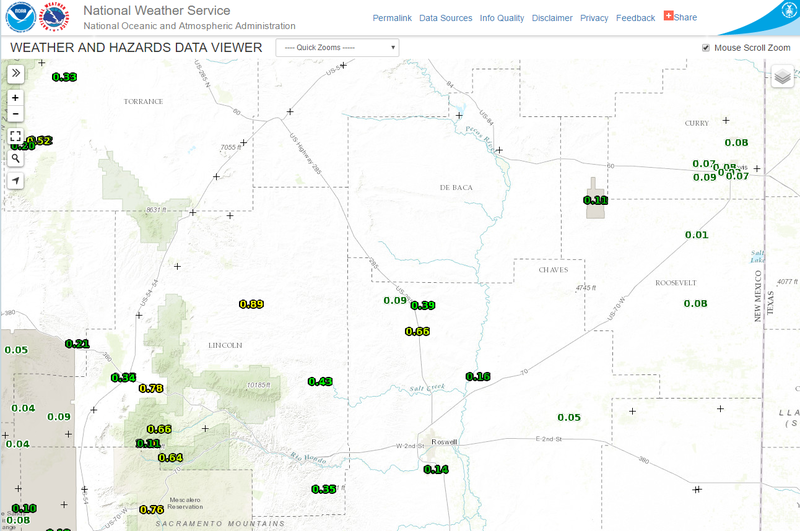 Light rain is being reported in the Pecos Valley with Roswell reporting .15". Between 7:30 AM and 9:45 AM this morning I've picked up .07" here at our home in Carlsbad. FREEZE WATCH TONIGHT FOR SE NEW MEXICO! 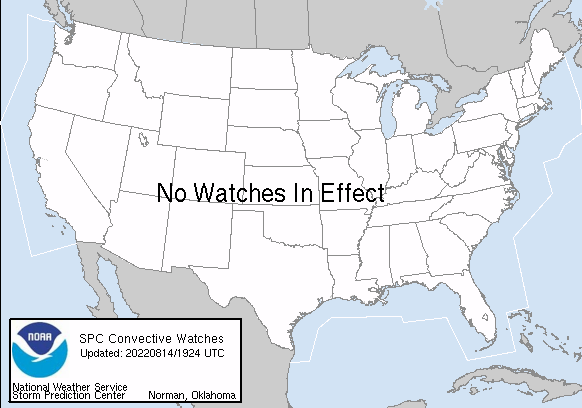 Winter Storm Warnings/Watches & Winter Weather Advisories Continue From New Mexico Northeast Into Nebraska. NWS Albuquerque 24-Hour Rainfall & Snowfall Reports. 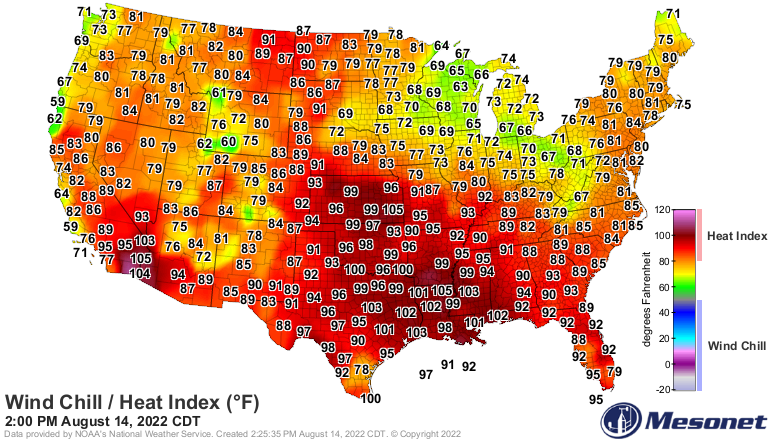 (As Of 2:51 PM MDT This Afternoon). 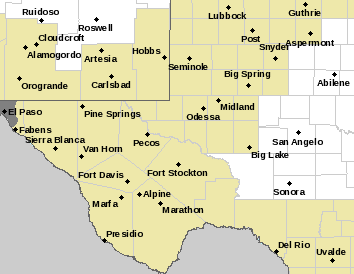 • 3 ENE TUCUMCARI - 1.40 in. 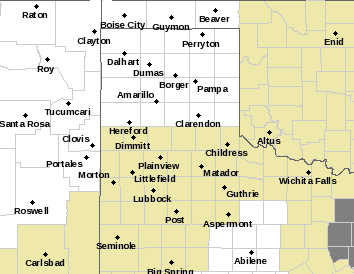 • 1 SW FORT SUMNER - 1.30 in. • 3 WSW LOGAN - 1.15 in. • 10 ESE TUCUMCARI - 1.02 in. • 11 ENE BELL RANCH - 0.91 in. • 1 N RUIDOSO - 0.84 in. • 2 ENE CLAYTON - 0.76 in. • 1 ESE LINCOLN - 0.68 in. • 5 SSW MESA - 0.65 in. • 2 E FORT SUMNER - 0.61 in. • 3 N SEDILLO - 0.59 in. • 6 SE SANTA FE - 0.57 in. • 1 WNW LAMY - 0.54 in. • 2 WSW SUNSET - 0.54 in. • 33 NNE SOCORRO - 0.52 in. • 2 SSE SANTA FE - 0.52 in. • null ROWE - 0.45 in. • 4 WSW MILLS - 0.44 in. • 9 SE ALBUQUERQUE - 0.43 in. • 4 N CANONES - 0.41 in. • null NARBONA PASS - 0.38 in. • 7 SSW COYOTE - 0.37 in. • 4 ESE CHACO CANYON - 0.34 in. • 1 NNE VALENCIA - 0.31 in. • 3 NNW ISLETA PUEBLO - 0.30 in. • 3 ENE TRUCHAS - 0.29 in. • 3 NNE LA CIENEGA - 0.28 in. • 12 SSW EL VADO - 0.28 in. • 4 ENE SANTA FE - 0.27 in. • 5 E SANTA FE - 0.27 in. • 2 SE OHKAY OWINGEH PUEBLO - 0.27 in. • 1 SSE CLINES CORNERS - 0.26 in. • 1 N NEW LAGUNA - 0.26 in. • 3 SSW SAN MIGUEL - 0.25 in. • 6 SSE QUEMADO LAKE - 0.25 in. • 1 W WHITE ROCK - 0.24 in. • 5 W ESTANCIA - 0.22 in. • 2 NNW PONDEROSA - 0.21 in. • 9 SW CUBA - 0.18 in. • 8 ESE ALBUQUERQUE - 0.18 in. • null TORREON NAVAJO MISSION - 0.16 in. • 3 ESE MORIARTY - 0.16 in. • 2 ESE CORRALES - 0.15 in. • null CHAMA - 0.12 in. • 1 W MOUNTAINAIR - 0.11 in. • 12 S MONERO - 0.10 in. • 8 SW ROCIADA - 16.0 in. • 6 WNW TERERRO - 15.0 in. • 5 N LAMY - 12.0 in. • 4 E SANDIA PARK - 10.3 in. • 1 NNW LAMY - 10.0 in. • 8 S TIJERAS - 10.0 in. • 5 NW LAMY - 9.8 in. • 5 SW BONITO LAKE - 9.0 in. • 1 N MORIARTY - 9.0 in. • 2 S EDGEWOOD - 9.0 in. • 1 N ROCIADA - 8.5 in. • null SANTA FE - 8.4 in. • 4 NNW LAMY - 8.0 in. • 5 SSE LLANO LARGO - 8.0 in. • 1 ENE WHITE ROCK - 8.0 in. • 3 S SANTA FE - 8.0 in. • 4 NNW TRES RITOS - 8.0 in. • 2 WNW SEDILLO - 8.0 in. • null WHITE ROCK - 8.0 in. • null SANDIA PARK - 8.0 in. • 2 SE MANZANO - 7.0 in. • 11 NNW CANON PLAZA - 7.0 in. • 1 SW UTE PARK - 7.0 in. • 2 WNW PONDEROSA - 7.0 in. • 3 NNE SANTA FE - 7.0 in. • 1 W SANTA FE - 6.5 in. • 4 E SANDIA PARK - 6.5 in. • 1 WSW SEDILLO - 6.1 in. • 1 SSW WHITE ROCK - 6.0 in. • 6 NW CORONA - 6.0 in. • 1 WSW LOS ALAMOS - 5.6 in. • 6 SSE SANTA FE - 5.6 in. • 2 W PONDEROSA - 5.6 in. • 5 NW SANTA FE - 5.5 in. • 1 ENE CEDAR CREST - 5.5 in. • 1 WNW WHITE ROCK - 5.3 in. • 7 E CANJILON - 5.0 in. • 7 S OJO ENCINO - 4.5 in. • 6 SSE SANTA FE - 4.5 in. • 4 ESE SANDIA PARK - 4.5 in. • 1 SSW TIJERAS - 4.2 in. • 7 NW LAMY - 4.2 in. • 7 ESE DES MOINES - 4.1 in. • 12 SSE COYOTE - 4.0 in. • 2 SE ALTO - 4.0 in. 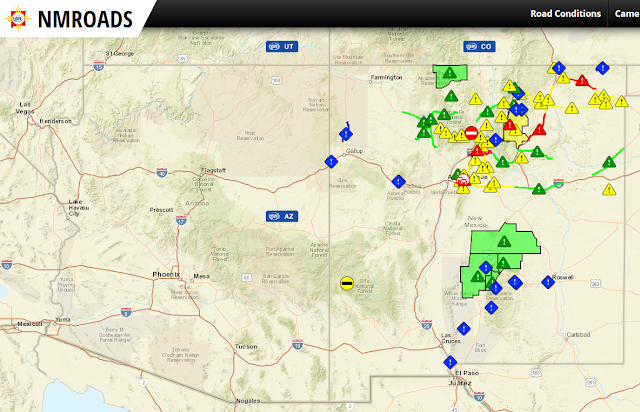 • 2 SW AGUA FRIA - 3.9 in. • 4 E SAN ANTONITO - 3.7 in. • 2 NE PLACITAS - 3.5 in. • 1 ESE TRUCHAS - 3.4 in. • 2 E SAN ANTONITO - 3.3 in. • 3 NNE LOS CERRILLOS - 3.0 in. • null LOS ALAMOS - 3.0 in. • null TECOLOTE - 3.0 in. • 5 W ANGEL FIRE - 3.0 in. • 11 ENE RED RIVER - 3.0 in. • null TRES RITOS - 3.0 in. • 6 NNW LAMY - 3.0 in. • 4 SE SANTA FE - 2.7 in. • 5 ENE LOS CERRILLOS - 2.5 in. • 4 NE TIJERAS - 2.5 in. • 4 SSE CEDARVALE - 2.0 in. • 1 S MOUNTAINAIR - 2.0 in. • 2 W ANGUS - 2.0 in. • 3 SSW ENCINO - 2.0 in. • 4 NW LAMY - 2.0 in. • null VAUGHN - 2.0 in. • 9 NE ALBUQUERQUE - 1.8 in. • 8 ENE ALBUQUERQUE - 1.5 in. • null SAN JON - 1.3 in. • 1 SSE GLORIETA - 1.3 in. • 3 N BROADVIEW - 1.2 in. • 13 NW TAOS - 1.2 in. • 2 SSE ALTO - 1.1 in. • 2 SW CAPITAN - 1.0 in. • 1 ESE ABBOTT - 1.0 in. • 3 NW TAOS PUEBLO - 1.0 in. • 3 S SANTA CRUZ - 1.0 in. • 8 NNW OMEGA - 1.0 in. • 8 ESE ALBUQUERQUE - 1.0 in. • 2 E SAN PABLO - 0.8 in. • 2 WSW EL MORRO - 0.8 in. • null CHAMA - 0.8 in. • 3 E LOS ALAMOS - 0.7 in. • 2 NW EL RITO - 0.7 in. • null LA PLATA - 0.5 in. • 8 W SANDIA PARK - 0.4 in. • 2 W DATIL - 0.3 in. • 3 WNW MADRID - 0.2 in. • 3 W LOGAN - 0.1 in. 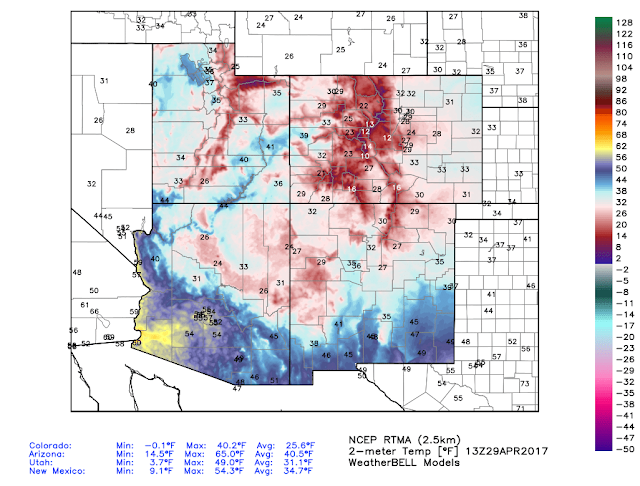 • 8 ENE ALBUQUERQUE - 0.1 in. • null ARROYO HONDO - 0.1 in.